The two-year fellowship track is available to candidates applying to study in the MTS or MDiv programs. The first year integrates intensive integration of theological study, spiritual formation, and theological reflection on practice. Fellows are introduced to foundational concepts in theology and church history through the courses required by their certificate or degree programs and take at least two core courses focused on the intersection of theology and culture. 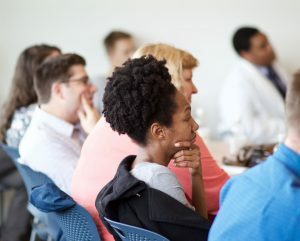 The second year promotes the further development of fellows as scholars and teachers at the intersection of theology and health care. The two-year TMC Fellowship provides a tuition grant of up to $20,000 ($5,000 per semester for 4 semesters) in addition to other scholarships and financial aid available through the school. Starting in 2019, we are also offering three merit-based full-tuition scholarships for fellows who apply to study in the MTS program. Click here for a hypothetical example of scholarships and tuition expenses. Participate in the 2-semseter Spiritual Formation group (CHURCHMIN 700). Complete a 2-semester service-learning/theology in praxis project. This component typically requires 2-4 hours per week, or 20-30 hours per semester. Participate regularly in the semi-monthly TMC Seminar, a semi-monthly lunch conversation that engages theology and health care. Complete at least one course satisfying the elective requirement for the Certificate in Theology, Medicine, and Culture. Serve as mentor to first year fellows, including leading a series of lunch conversations. Complete a scholarly project and present it in a public venue (with approval by TMC directors). Participate regularly in the semi-monthly TMC Seminar. Click here for an example of a typical course schedule for a fellow on a two-year track.